In its day it was extremely fast. It held its own with high dollar exotics, yet the price was reasonable. Many say that no car before or since can equal the E-Type. 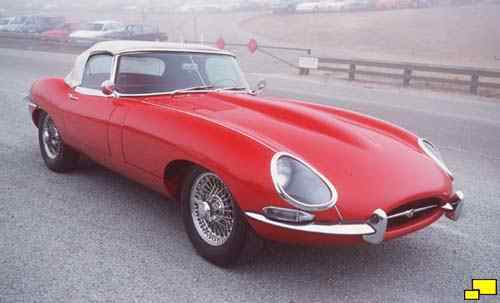 Those who make the claim do not often get an argument; in automobile enthusiast circles, Jaguar's E-Type rules. The most special of Coventry cat possessed a flair, speed, charisma and soul that we may never see again. Above Left: The Jaguar XK 120. Jaguar's first post war model set the standard for style, engineering and value. Right: The C-Type which took first place in 1953 at LeMans with Duncan Hamilton and Tony Rolt driving. "C" was short for competition. Below: Pressure from other teams forced Jaguar to build a more competitive model, and the D-Type was born. The D-Type chassis consisted of a stressed monocoque behind the engine with a space frame in the engine area; the E-Type would feature the same configuration. Another big improvement was in the brakes, with drums being replaced by discs at all four corners, another feature that the E-Type would benefit from. Shown is a D-Type doing its thing at a recent historics race at Laguna Seca. Aerodynamics were becoming part of the design as evidenced by the stabilizing fin behind the driver and the cover over the passenger compartment. The family resemblance with the E-Type is apparent. Almost from the start, the D-Type was a phenomenal success . It came in second in the 1954 24 hour Le Mans race, then won the 1955, 1956 and 1957 events, an incredible feat for any time. In the 1957 race, five of the top six finishers were D-Types! Approximately 67 D-Types were built. Bridging the gap between the D-Type and the E-Type was a production model called the XK-SS. Conventional doors were added as were headlights and other street required items. Development of the car that was to become the E-Type actually started as a race car program. As the protoypes were built and tested, circumstances and the racing world changed and the project gradually became a road car. A prototype (known as the E2A) were raced on a limited basis. A major milestone achieved was the development of an independent rear suspension, which was to become one of the many high points in the design of the Jaguar E-Type. The Jaguar E-Type was officially introduced to the world in March 1961 in Geneva, Switzerland. The reaction was immediate and enthusiastic. The styling was partly responsible; the sensuous shape still gets rave reviews. The list of mechanical features was, for 1961, stunning: a double overhead cam engine, fully independent rear suspension and four wheel disc brakes (inboard at the rear no less, an exotic touch usually found only on race cars) proved the E-Type to be an advanced automobile. The price ($5,595 (�1,830) for the roadster) made the E-Type an exceptional bargain; the comparitively crude Corvette cost less but offerings from Aston Martin and Ferrari were considerably more. The future of the E-Type as an automotive classic was secured. You may be more familiar with Jaguar's most revered sports car as having the name "XKE". Jaguar purists insist that the proper term is "E-Type", and all of the non-marketing literature from the factory referred to their popular two seater (and 2+2) as such. "XKE" has found its way into popular culture however. It is also a fact that the factory used the term in their sales efforts, so they can't be too offended by its use. At various times, even the terms "XK-Engineering" and "XK-Elegence" was employed. Here at WebCars! we are comfortable with both methods, although we use the term E-Type for consistency.